It appears highly unlikely that the Lakers are gonna land any of these guys now. The Lakers reportedly are whiffing — badly — in free agency when it comes to the big men on their list. 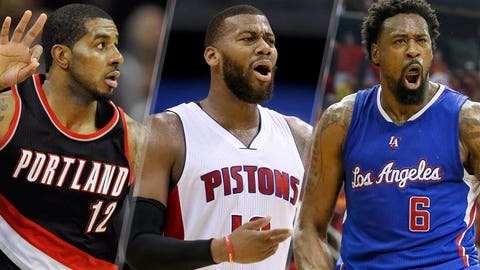 Its looking more and more likely that the team, which lost a franchise-record 61 games last season, apparently will be unable to lure any of its three main targets — LaMarcus Aldridge, Greg Monroe and DeAndre Jordan — per a report by Mike Bresnahan of the Los Angeles Times. Why? Mostly, the report claims, it came down to L.A.’s underwhelming presentations to the players. The Lakers will get a second meeting with LaMarcus Aldridge today in Los Angeles, league source tells Yahoo Sports. One source briefed on the Lakers second meeting with Aldridge told Yahoo Sports: "They want to see if they can get it right." Yahoo Sources: Another high-profile team is pursuing the possibility of gaining an audience with LaMarcus Aldridge: The Miami Heat. There’s not much in the way of details from Monroe’s Wednesday meeting with L.A., but it must not have gone too great for the Lakers because Monroe reportedly will be heading to the Milwaukee Bucks instead. Yes, Monroe would rather play in Milwaukee than in Los Angeles. Lakers meeting with DeAndre Jordan scheduled to start now. 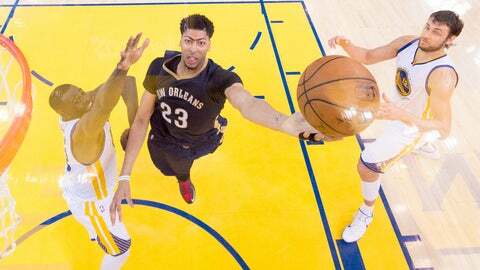 He's considered a long-shot for them, seemingly drawn more to Clippers or Dallas. Sympathy for the Lakers, from a Clippers player no less. Jesus, what has the world come to? Why doesn’t anyone want to play for the legendary, 16-time world champion Los Angeles Lakers? The LA Times notes that Aldridge apparently just wasn’t too keen on the Pau Gasol comparison. But the Lakers had a good deal of success with a Kobe-Pau attack, so Bryant’s analysis seems fair. Laker official quickly defends Kobe, who wasn't contentious/abrasive like in meeting with Dwight 2 years ago: "Not his fault at all." No, ultimately in this case — or least in the cases of Aldridge and Jordan — it seems like the Lakers just failed to piece together a compelling presentation. When it came to Aldridge, the LA Times report claims that the organization focused plenty on "branding opportunities" for the All-Star forward and also underscored the team’s youth, "but Aldridge simply wanted more in-depth basketball talk." So they think they’d have had a better shot if they had a better roster? Um, yeah, no kidding. Seems pretty obvious. It’s the second part of that statement that the Lakers may need to be focusing on. The Lakers, like it or not, need to beef up their bball analytics. They've fallen behind there, stuck in old-school way of thinking.